Large beans can be used for main course as well as addition to other dishes. 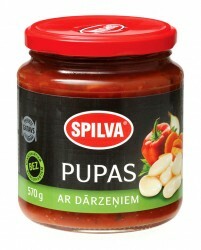 Good for both cold and hot usage together with sausages, meat or poultry. The product can be prepared very quickly and it saves time for those who usually are busy. Beans are prepared together with different vegetables – carrots, paprika, onions) that are covered with seasoned tomato sauce. Product 100 g contains: energy value – 47 kcal (196.6 kJ), fat – 2.1 g, carbohydrates – 9.2 g, protein – 2.8 g, salt – 1.4 g.